Pompeii was a Roman city. Now it is a UNESCO World Heritage Site. On 24 August, 79 AD, a volcano called Mount Vesuvius erupted and destroyed the city and its people, killing 2,000 of them. Pompeii is now considered one of the world's most important historical sites because of the way the volcanic ash preserved the city and its people. This gives historians and archaeologists a vivid picture of life in the Roman Empire around 2,000 years ago. Archaeologists have found graffiti written by the people who lived in the town. People often wrote on walls, and archaeologists have been able to read some of what they wrote. Pompeii is an interesting attraction for tourists from around the world and is visited by 2.5 million people every year. The town was started around the year 600 BC. It was started by a group of people from central Italy, the Osci. They chose to start it in this location because it was already an important location for trade by both land and sea. By the 5th century BC, Pompeii had become part of Rome. While under Roman control, Pompeii was improved a lot. The Romans built Aqueducts, and these were used to provide the citizens with water. Before the eruption, Pompeii was a beautiful and wealthy city. At the time of the eruption, the town may have had about 11,000 people living there. It was in an area where Romans had holiday villas. Modern professor William Abbott said, "At the time of the eruption, Pompeii had reached its high point in society as many Romans frequently visited Pompeii on vacations." 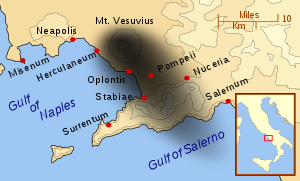 Pliny The Younger was a witness to the eruption of Mount Vesuvius. He sent letters to a friend describing the eruption. For he was much too scared to go any closer, he stayed where he was. He was quite a distance from the sight, but close enough to see the eruption clearly. ↑ 1.0 1.1 "Archaeological areas of Pompei, Herculaneum and Torre Annunziata". UNESCO. Retrieved 2011-04-02. ↑ Wallace-Hadrill, Andrew (2011-03-29). "Pompeii: Portents of Disaster". BBC. Retrieved 2011-04-02. This page was last changed on 4 March 2019, at 01:24.